Arama, F.; Pujol, J.; Ajmat, Raul Fernando; Sandoval, J. 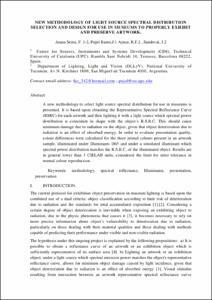 A new methodology to select light source spectral distribution for use in museums is presented. It is based upon obtaining the Representative Spectral Reflectance Curve (RSRC) for each artwork and then lighting it with a light source the spectral power distribution of which is coincident in shape with the objects RSRC. This should cause minimum damage due to radiation on the object, as the deterioration of the object due to radiation is an effect of energy absorbed. In order to evaluate quality of presentation, colour differences were calculated for the three primal colours present in an artwork sample, illuminated under Illuminants D65 and under a simulated illuminant the spectral power distribution of which matches the RSRC of the illuminated object. Results are in general lower than 3 CIELAB units, considered the limit for strict tolerance in normal colour reproduction. Arama, F., Pujol, J., Ajmat, Raul Fernando, Sandoval, J. New methodology of light source spectral distribution selection and design for use in museums to properly exhibit and preserve artwork. "Light & Engineering", 01 Gener 2015, vol. 23, núm. 3, p. 18-23.